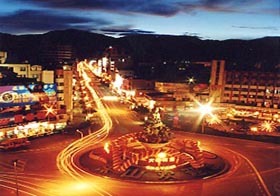 Baoshan City (bǎo shān shì 保山市) is situated in the southwest of Yunnan Province (yún nán shěng 云南省), bordered by Burma in the south and northwest. Within the province, it neighbors Lincang Region (临沧) in the east, Nujiang Lisu Autonomous Prefecture (nù jiāng lì sù zú zì zhì zhōu 怒江傈僳族自治州) in the northeast and Dehong Dai and Jingpo Autonomous Prefecture (dé hóng dǎi zú jǐng pō zú zì zhì zhōu 德宏傣族景颇族自治州) in the southwest. It is nearly 500 kilometers (310 miles) from Kunming (kūn míng 昆明), the capital city of Yunnan Province. Under Baoshan City’s administration, there are 1 district, namely Longyang District (lóng yáng qū 隆阳区), and 4 counties, namely Shidian (shī diàn xiàn 施甸县), Tengchong (téng chōng xiàn 腾冲县), Longling (lóng líng xiàn 龙陵县), Changning (chāng níng xiàn 昌宁县). Seat of the city government: No.26, Tongren Street, Longyang District. The area was called Yongchang (yǒng chāng 永昌) in ancient times. 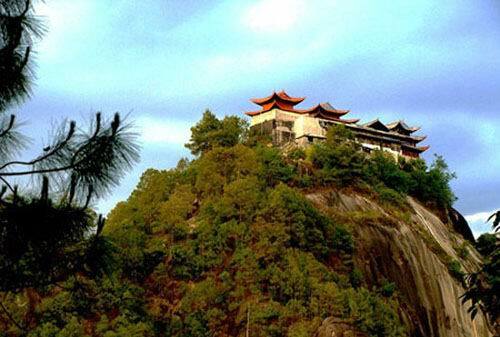 Historically, it was the first residence for human settlers in western Yunnan. During the middle period of the Warring States Period (476BC-221BC), it was the center of ancientAilao (āi láo 哀牢) Kingdom. As the Ailao Kingdom turned to decline, Yongchang Shire, the origin of Baoshan City was established in the year of 69 of the Eastern Han Dynasty (25-220) as the second largest shire in the country. It was during the Tang (618-907) and Song (960-1279) dynasties that it successively belonged to two ethnic regimes, Nanzhao State (nán zhào guó 南诏国) and Dali State (dà lǐ guó 大理国). The name of Baoshan was first used in 1524. Baoshan lies in the south end of the Hengduan Mountains (héng duàn shān mài 横断山脉) with more than ninety percent of its territory occupied by medium mountain and quasi-mountain areas. Another over seven percent is plateau plains and basins. Due to the complex topography at low altitude in plateau, subtropical, temperate and plateau climatic types coexist in Baoshan. Its weather is moderate throughout the year, but the temperature varies greatly during a day. The annual average temperature falls between 14 and 17 degree centigrade (57.2-62.6 degree Fahrenheit). It is fine to visit during the whole year. The most attractive tourist destination in Baoshan is Tengchong County, which is one of China’s famous geothermal places, pervaded by boiling springs, eruptive fountains and hot spring groups. Heshun (hé shùn 和顺) means peace and harmony. The title of the township is derived from a verse describing "the rising clouds that herald auspicious future and the gentle breeze that breathes peace and harmony." The town consists of over 1,300 households and 6,300 and more people. From ancient times on, it has been a place where talented people were brought up. Many of the Heshun people who live abroad are successful businessmen or scholars of great attainments doing their bits for the prosperity of the countries they reside. 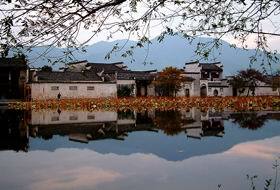 Heshun is a very beautiful place with many ornamental structures like pavilions, memorial halls or archways, lotus ponds, marble balustrades, etc. 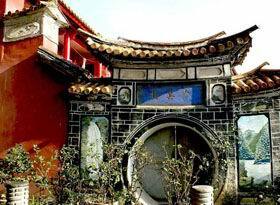 The most important scenic spot that a visitor to Heshun cannot afford to miss is Shuidui (shuǐ duì 水碓), an ancient water mill near a body of limpid water named Yuanlongtan (yuán lóng tán 元龙谭). Yuanlong Pavilion (yuán lóng gé 元龙阁) which overlooks the clear pond is an ancient structure. The pavilion was constructed in the 27th year of Emperor Qianlong's (qián lóng 乾隆) reign in the Qing Dynasty (1762 A.D.). The sublimity of the ancient architecture with its excellent layout of the halls, kiosks, balconies and bowers of carved beams and painted rafters add beauty to the serenity of nature. The inscriptions, tablets and couplets, well composed and written by outstanding calligraphists, are highly attractive. The fountain by the side of the pavilion is known by the name "Dragon Pond". The Heshun Library situated on the campus of Yiqun Middle School, the biggest one at the township level, is the pride of the Heshun people. 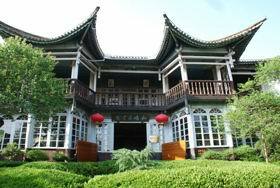 The library buildings with flower gardens in the front courtyard show styles of traditional Chinese architecture. The library, set up in 1924, is in possession of over 60,000 volumes of books, many of which are rare editions of ancient works. The library feels honored with the inscriptions by such famous figures as Xiong Qinglai (xióng qìng lái 熊庆来), Liao Chengzhi (liào chéng zhì 廖承志), Zhang Tainfang (zhāng tiān fàng 张天放), etc. Traditionally, the azalea is one of the ten most famous flowers in China. This beautiful flower can be found throughout the county. Of more than 800 varieties of azaleas, over 600 kinds have been found in China, which is the original birthplace of azaleas. Azaleas grow compactly in Yunnan, for more than 300 species have been found in this province. Usually, the azalea is a shrub or small arbor of one or two meters tall. However, in the Gaoligong Mountains (gāo lí gòng shān 高黎贡山) of Tengchong, the azalea has a height of several dozens of zhang (zhàng 丈) (about 3 meters), and produces countless blooms. 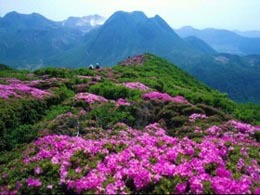 Therefore, it is called "the Giant Azalea". In February of 1981, in the virgin forest of the Gaoligong Mountains in Tengchong, Chinese scientists found a group of the tallest and biggest azaleas. The biggest one, with a height of 25 meters and a diameter of 3.07 meters at its foot, is over 500 years old, known as "the King of the Azalea in the World". "The Giant Azalea" is now under national protection. The camellia is one of the ten most famous flowers in China, and ranks first among the eight most famous flowers in Yunnan. Therefore, it is honored as the City Flower of Kunming. 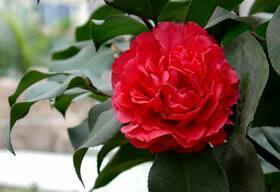 The original species of the camellia is the red-flower camellia oleifera in Tengchong. It is a wild plant with thick and strong trunk and branches. The tree is tall and beautiful; when it is in full bloom, its flowers look delicate and charming. The red-flower camellia oleifera are found mainly in the mountain areas in Yunhua (yún huá shān 云华山). Only in Yunhua there is over 7,000 mu of such camellias. Late in winter and early in spring during the flowering season, the trees are attractively in full bloom, making the whole area a flaming flower sea. That is one of the major scenic spots in Tengchong. The red-flower camellia oleifera is well-known not only for its beautiful flowers but also for its fruit, from which oil can be extracted. 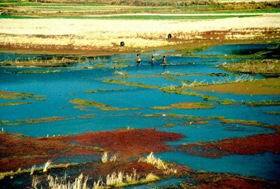 It is of high economic value and called "Green Oil Reservoir". The state has decided to build Tengchong into a base of the red-flower camellia oleifera. According to historical accounts, when Zhang Qian (zhāng qiān 张骞) (?-444 B.C.) was on his mission to Bactria (now the northern part of Afghanistan) in 122 BC, he saw some Shu cloth (shǔ bù 蜀布) and "qiong" bamboo sticks (qióng zhú zhàng 筇竹杖) imported from Sichuan to India and came to know that merchants from Sichuan had a long time before traveled to India for trade via Yunnan and Burma. Afterwards, the Han empire, having removed obstacles imposed by the Kunming tribes around Erhai Lake (ěr hǎi 洱海), recruited a great amount of armed laborers to undertake on a large scale the building of the Bonan Route. Passing what is now Xiaguan (xià guān 下关) and Yongping (yǒng píng 永平) and crossing the Lancangjiang River (lán cāng jiāng 澜沧江), this road extended via Baoshan and Tengchong far into Burma, India and other countries. In the Tang Dynasty, it prospered and throve even more, showing no decline during a long period of time. Up to now there still can be found many historical relics along this route. For instance, on the famous Bonan Mountains (bó nán shān 博南山) at Yongping one can still see the stone-paved ancient road winding over the sublime and awe-inspiring mountain ranges. The place near today's Jihong Bridge on the bank of the Lancangjiang River used to be a famous ancient ferry in the Western Han Dynasty. In the 12th year of the reign of the Han Emperor Mingdi (A.D. 69), Yongchang Prefecture was instituted in what in Baoshan today, thus causing the road's further development. 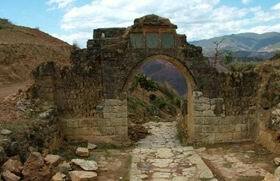 In 1982, a tablet was unearthed near the present-day Yunnan-Burma Highway (formerly the Burma Road) between the Nujiang River and the Gaoligongshan Mountain. This tablet unearthed at the ancient stage is a most convincing material evidence to this effect. February 7th in Chinese lunar year is Lisu people’s Sword Pole Festival (dāo gǎn jiē 刀杆节). 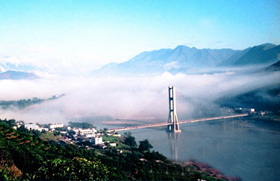 The celebrations for the festival are held in Lisu hamlets along the Nujiang River. A few strong young men jump into a sea of fire with bare feet and perform a variety of stunts. 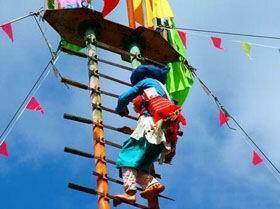 They also climb a pole with sharp swords without shoes and act some difficult moves on the dangerous pole. These performances are not only a kind of folk traditions and customs activities, but also show people the Lisu people’s extremely hard and bitter life experience and their indomitable spirits. At night, there are dances and singing around a bonfire. 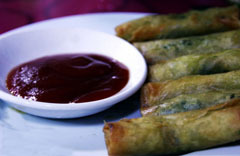 Dajiujia (dà jiù jià 大救驾) which means to come to the emperor's rescue, is one of the most famous local flavors of Tengchong, one of fried Erkuai (ěr kuài 饵块). The way of cooking it is that: cut erkuai into pieces, add ham, egg, meat, carrot and tomato, deep-fry them in the pot to well-done. It's said that when Yongli (yǒng lì 永历) emperor of the Ming dynasty went into exile to Tengchong, he was miserable from hunger. A kind farmer cooked a big plate of erkuai for him. At that moment, Yongli emperor couldn't believe that there was so delicious food existing in the world. The aftertaste lingering on him, he sigh with deep emotion "it rescued me!" So Dajiujia became another name for Tengchong erkuai and sliced erkuai, whose fame got around fast. Dabaoipian (dà báo piàn 大薄片) is a dish which tests cooks cutting skills. The main materials are pig's ear, tongue and mouth, of which the cooking method is unique. Wait until the well-done materials are cool, then cut them into pieces as big as a palm and as light as a piece of paper. If you stick it on the wall, it won't drop, hence the name "Dabaopian". Then you can eat it with ready-made seasonings. Tengchong preserved fruit take fruits of sub-tropical and temperate zone as their main materials, of which assorted preserved papaya candy, licorice mango and preserves are famous. Tengchong preserved fruits choose fresh plum, mango, hawthorn, papaya and red bayberry as material, adapt scientific formula and produce more than 30 kinds preserves of Beijing (běi jīng 北京) and Guangdong (guǎng dōng 广东) flavors, i.e. licorice mango, preserved plum, lemon plum, appetizing hawthorn, sliced hawthorn, honey papaya etc. 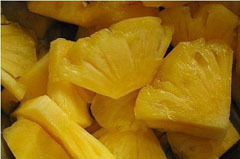 you may find every kind of preserves made from fruits of sub-tropical and temperate zones and each has its own feature. Baoshan Airport is 9 kilometer (5.6 miles) from the Longyang District. At present, scheduled flight to Kunming is available once every day. In addition, it has indirect flight to Guangzhou through Kunming daily.